NETWORK FINALS: The 10PM episode of CROWDED and the rerun of THE FLASH each lost 0.1 in final numbers. CABLE HIGHLIGHTS: Remarkably, 6 of the Top 10 slots on Tuesday cable were filled by primary election coverage. As usual, CNN led in 18-49s, topping at 1.22 in the 9PM hour, while FOX News had the advantage in the older total viewers metric, peaking at 5.2M in the 8PM hour. Only FX’s PEOPLE V. OJ SIMPSON was close to the election miniseries, down 0.07 from last week to 1.17. 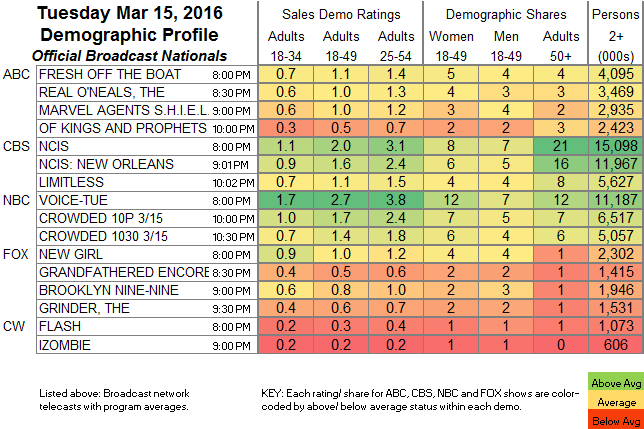 HGTV’s FIXER UPPER lost 0.06 to 0.77, with HOUSE HUNTERS at 0.56 and HOUSE HUNTERS INTL at 0.48. OWN’s THE HAVES AND HAVE NOTS climbed 0.08 to 0.77, and the lead-out season premiere of IF LOVING YOU IS WRONG was at 0.69. Bravo’s REAL HOUSEWIVES OF BEVERLY HILLS gained 0.04 to 0.67. On TLC, JILL & JESSA was at 0.61, and THE WILLIS FAMILY was at 0.25. USA’s CHRISLEY KNOWS BEST edged up 0.02 to 0.61. Tru’s coverage of the NCAA TOURNAMENT play-in games was at 0.60/0.35. On Freeform, the season finale of PRETTY LITTLE LIARS dropped 0.07 from last week to 0.59, which was down a brutal 0.68 from last March’s finale; its newly-renewed lead-out SHADOWHUNTERS fell a tenth from last week to 0.33. Spike’s INK MASTER jumped 0.18 to 0.58, with the REDEMPTION after-show at 0.40. Discovery billed its MOONSHINERS as a “special” at 0.52. Comedy Central’s TOSH.0 gained 0.09 to 0.50, and NOT SAFE WITH NIKKI GLASER was up 0.04 to 0.29. 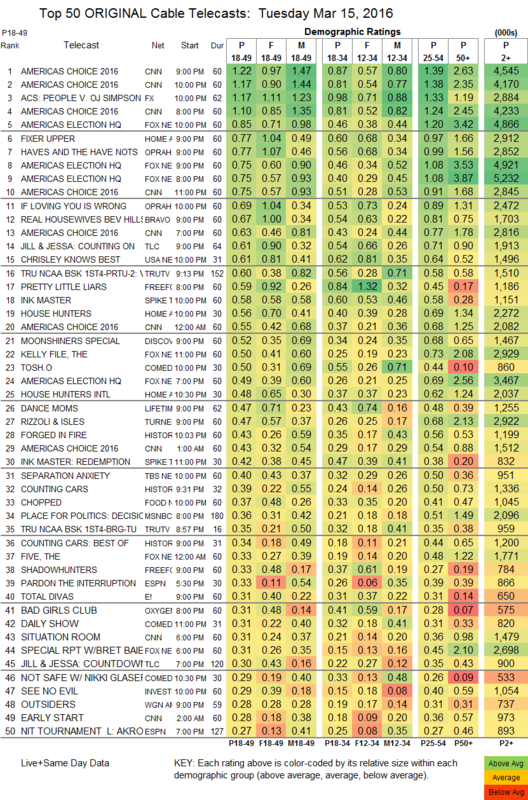 On Lifetime, DANCE MOMS lost 0.02 to 0.47, and MOTHER/DAUGHTER EXPERIMENT dropped 0.08 to 0.15. The season finale of TNT’s RIZZOLI & ISLES slipped 0.03 from last week to 0.47, which was down 0.13 from last March’s finale. History’s FORGED IN FIRE gained 0.03 to 0.43, and COUNTING CARS was up 0.06 to 0.39 after a 0.34 clip show (up 0.03 from last week’s clip show). TBS premiered SEPARATION ANXIETY at 0.40. Food Network’s CHOPPED fell 0.07 to 0.37. On E!, TOTAL DIVAS rose 0.06 to 0.31, and LA CLIPPERS DANCE SQUAD debuted at 0.14. WGNAmerica’s OUTSIDERS added 0.04 to 0.28. On MTV, AWKWARD returned at 0.25, and FAKING IT managed just 0.13. BET’s IT’S A MANN’S WORLD was at 0.22/0.20 after last week’s 0.22/0.21. A&E’s FIT TO FAT TO FIT slimmed down by 0.06 to 0.18. POP’s IMPACT WRESTLING gained 0.03 to 0.09, with the re-airing hugely up by 0.05 to 0.06/123K, apparently boosted by having the season premiere of SCHITT’S CREEK as a lead-in at 0.04/123K.